If a federal solar initiative saves a college student in New Jersey from asthma by reducing sulfate particles in the air, who will know what happened? 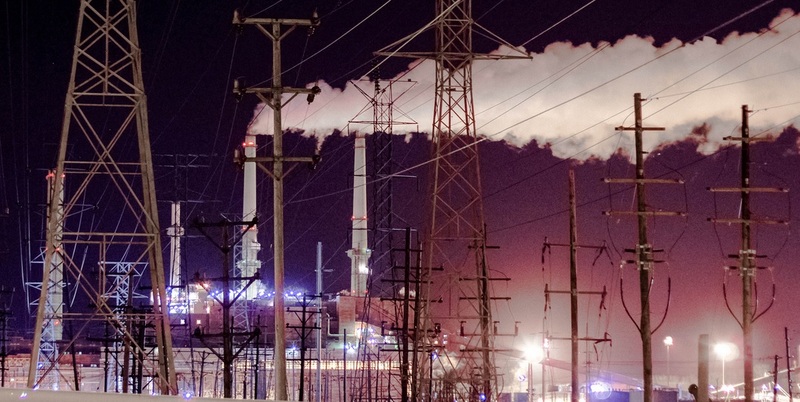 This power plant in Waukegan, Ill. has an eerie glow. A new report from National Renewable Energy Laboratory (NREL), “The Environmental and Public Health Benefits of Achieving High Penetrations of Solar Energy in the United States,” delves into datasets to shine a light on the large-scale societal benefits of the decade-long SunShot Initiative. The primary goal of SunShot is to drive the cost of solar down to $1 per watt in the United States. The initiative funds research and development across all sectors. It began in 2011. If SunShot achieves its goals, the 2012 Sunshot Vision Study says, solar power might meet around 14 percent of United States electricity demand by 2030 and 27 percent of it by 2050. If this occurs, what health and environmental benefits can we expect to see? This report said that in this scenario, the program would save over 25,000 lives by improving air quality. The economic benefits of the climate mitigation would be over $225 billion. The corresponding reduction in power-plant water withdrawal would be 46 trillion gallons. The authors of the report work at NREL and Lawrence Berkeley National Laboratory (LBNL). They grouped the environmental benefits into three categories: climate mitigation, air quality, and water conservation. The projected global climate benefits are worth $259 billion. This estimate is based on an assumption about policies being based on the social cost of carbon. If, alternatively, solar was used to reduce the legal cost of carbon emissions, the benefits would be $239 billion. Lifecycle greenhouse gas emissions from power production would be reduced by 18 percent in 2050. Cumulatively, between 2015 and 2050, these emissions would be cut by 10 percent. What does this mean in terms of down-to-earth environmental changes that United States residents may see or experience? On June 14, Climate Access hosted a webinar called “Communicating Summer Climate Impacts.” According to the presenters, climate change can cause a broad range of social disruptions affecting the water cycle, storms, ecosystems, health and security. Changes in how water cycles between rivers, snow packs, clouds and the ocean can combine with storms to result in droughts, floods, and other damage. Droughts can increase forest fires, affect species survival, and cause agricultural shortages. Flooding can destroy infrastructure, erode farmland, displace low-lying communities, disperse pollution, damage ecosystems, interfere with transportation, and require massive home repairs. Marine and land ecosystems are altered by a changing climate. As species migrate, oceans acidify, and cultivation zones shift, the futures of individual fisheries, communities and farms become uncertain. Heat-related public health issues increase with climate change. These can be related to insects, pollution, cardiac problems, respiratory issues, and mental illnesses. Heat aggravates some of these conditions and can exacerbate medication side effects. Crime and conflict can intensify due to a heating globe, causing violence and affecting economic stability. Averting this sea change that affects so much of what we take for granted brings financial benefits. But it is important not to understate the many qualitative, personal, local stories that may go along with this immense potential cost savings. When the authors added air quality benefits to the equation, they found the total savings from the program was over $400 billion in one scenario. “The high solar penetration scenario reduces premature mortality by between 25,000 and 90,000 lives,” said Ryan Wiser, senior scientist and deputy group leader of the electricity markets and policy group at LBNL, during a webinar on June 22. During the event, “Societal Benefits on the Path to Sunshot,” Wiser said the report drilled down into a set of health conditions related to bronchitis, asthma, upper respiratory conditions, lower respiratory conditions, and heart attacks. According to the report, these problems are due to sulfur dioxide (SO2), nitrogen oxides (NOx), and fine particulate matter (PM2.5) – especially SO2. SunShot would reduce the respective emissions of these three pollutants in 2050 by 15 percent, 18 percent, and 13 percent. The projected financial benefits of improved air quality would be $167 billion in one scenario. However, drilling down into the data reveals substantial regional variations depending on the location of the solar power. Wiser said locating solar in the mid-Atlantic would be high-leverage because the population there is substantial. In contrast, locating solar power in California would have a lower impact than it would elsewhere because it would displace natural gas plants rather than coal plants. “There are myriad benefits to reducing the use of water in the power sector,” Wiser said. Water shortages due to power-plant usage can compound the effects of climate-related problems. The authors reported the results in terms of gallons of water saved. Dry states were among the ones with the highest savings. “We don't have a lot of tools that can quantify the [water] benefits in monetary terms,” Wiser said. Power plant water use includes both withdrawal and consumption. Water that is withdrawn, but not consumed, is returned to the ecosystem, sometimes at a higher temperature. The data analysis showed SunShot could reduce power-sector water withdrawals by 8 percent in 2030 and 5 percent in 2050. This would save 46 trillion gallons from withdrawal, cumulatively. In this scenario, water consumption would be reduced by 10 percent in 2030 and 16 percent in 2050. The power-plant analysis involved a range of projected results across a few different scenarios. “We conduct a sensitivity analysis that uses equal proportions of dry, wet and hybrid cooling,” Wiser said.